Russian police have reportedly arrested a man on suspicion of masterminding two infamous hacking tools. 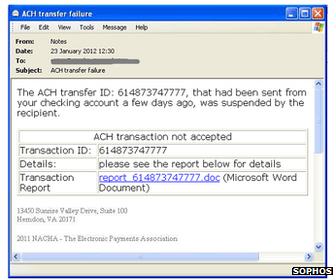 He is suspected of being the man behind the alias Paunch – the nickname used by the creator of the Blackhole and Cool exploit kits, sold to cybercriminals to infect web users with malware. The Russian authorities have not confirmed the details. But security firms said they had already detected a decline in the programs’ use. A spokesman for the law enforcement agency Europol told the BBC: “Europol and the European Cybercrime Centre has been informed that a high-level suspected cyber criminal has been arrested. The Russian police’s press office said it had nothing to add at this time. However, Alexander Gostev, chief security expert at the Moscow-based internet protection provider Kaspersky Lab, said the arrest had been confirmed to him by “anonymous sources”. The Blackhole kit, released in 2010, dominated the crimeware market throughout 2012 and the start of 2013, according to Fraser Howard, a researcher at the anti-virus company Sophos. He said the code had been sold for an annual licence of $1,500 (£940) or could be rented from its creator for $200 (£125) for one week’s use, among other price plans. The software targeted a range of vulnerabilities in the Java programming language, Adobe’s Flash media player, Windows software and PDF files. Although Mr Howard said Blackhole was once the biggest threat of its kind, he added that in recent months it had been overshadowed by rival kits, including Sweet Orange and Neutrino. According to the researcher, the Blackhole and Cool kits put together were only involved in about 4% of all malware detected by Sophos in August, down from 28% the previous year. The figure had since dropped to 2% in recent days, he added. Another independent security blogger stressed that the arrest was still significant. “If it’s true that the brains behind the Blackhole has been apprehended it’s a very big deal – a real coup for the cybercrime-fighting authorities, and hopefully cause disruption to the development of one of the most notorious exploit kits the web has ever seen,” said Graham Cluley. Mikko Hypponen, chief research officer at F-Secure, agreed. “If indeed it is Paunch that they arrested, that is a major arrest – he is a big deal,” he told the BBC. “He was clearly the biggest player in providing exploit kits – not just by selling them, but also renting and leasing them to online criminals. “Both Blackhole and its successor Cool have been very popular. Character artist Michael Ingrassia shows how you can develop your sculpting skills and find your artistic direction. As a 3D game artist, I have always preferred to work on stylised art projects rather than realistic ones. Stylising allows for creative freedom and extending belief of subject matter over realism. There are many tools within ZBrush that artists can use to achieve stylised sculpting effects, from massing out the form using DynaMesh to a wide variety of sculpting brushes and techniques. However, many of these tools and techniques can seem overwhelming or intimidating to artists who are just starting out. My tried and tested methods will help you streamline and simplify sculpting and stylising, using a few easy methods and tools you’ll learn to master quickly. One method I have used quite successfully in my years of sculpting characters is creating a very simple base mesh, doing some basic sculpting on the mesh (which I call ‘massing’), then reimporting the mesh at one or two division levels higher. It’s a really quick way to get your character modelled efficiently, and the new mesh will only require a small amount of re-topping instead of having to re-top the entire character. This method is similar to ZBrush’s new DynaMesh tool but with more control over the topology. I’m able to quickly add any necessary topology and edge loops in my 3D program then import the mesh back into ZBrush. Game artists will find this process works really well because the new base mesh is game-ready and will handle the final decimated mesh when backing out normals and ambient occlusion maps in programs like TopoGun. Try massing the head sculpt. Look in the Source folder in the files accompanying this video, where you’ll find base_meshHead.obj, a low-poly base mesh to experiment with. Keep base meshes very simple, evenly spaced quads with the minimum vertices possible. In minutes, you’ll have a good detailed base mesh that only requires simple re-topping. The main brushes I will be demonstrating in this tutorial include Standard, ClayTubes, MAHcut Mech A, Orb Cracks, Polish B and Rake. Once I have the character’s form massed out, I will begin working with several of my favourite sculpting brushes like Polish B and MAHcut Mech A to begin chiselling, carving and refining the edges, giving the character a nice clean and polished look. To create a manicured looking beard, mask out a section of Sir Robin’s chin to sculpt some added mass, and define the shape of the beard further using the ClayTubes and Move brushes. Then mask out the character’s head to inflate the mesh uniformly before you begin sculpting a lovely head of flowing hair. Start sculpting by selecting the ClayTubes brush again, but this time disable the square alpha map to achieve smooth, thick, liquid strokes. It’s important to sculpt the lower lying hair first, then swiping upper hair strokes in alternating ‘C’ and ‘S’ shapes. Repeat some strokes using a reduced brush draw size and add final top layer strokes where you want the main hair peaks to be. Soften the strokes you’ve made using the Smooth brush and then switch to the MAHcut Mech A brush. Holding down Alt, outline the shape of each hair tuft first to establish the main individual shapes, then on a second pass come back through each strand’s centre to enhance the primary curvature. Before jumping into adding stitches on your sculpt, it’s usually wise to prepare the different brushes’ stroke and intensity settings. Whether using ZBrush’s default stitch brushes or custom alpha maps, each stitch will react differently, so you’ll want to practise each of the stitches on a curved shape, such as a sphere. To give a unique look and feel on some parts of the character, I recommend sculpting some stitches directly rather than using a Stitch brush or alpha map. In the video I demonstrate how easy it can be to create a simple stitch with rivet and clothing stress pull. Paying special attention to little details like this will set your work apart from others. If you’re curious about creating your own Stitch Alpha map, take a look at MIstitch.psd, my custom stitch alpha in the scene files accompanying this tutorial. The first part of the cap sculpt will address the need for adding in some basic cloth folds. These simple folds will help to make the cap look more organic and less rigid. I’ll then add a noise texture pass using a Spray setting with a Cracked Rock alpha. This gives the cap a nice felt cloth look quickly. It’s important to do this texture pass first before adding details such as stitches. Getting the stitching pattern to step and repeat smoothly and flow along the model’s contour can take some trial and error – especially when pulling a seam around a mesh that needs to be turned in order to finish the stroke. One method that works best is to gently smooth the last stitch of the stroke so you can continue pulling the stitches to the end. At the end of the stitches, slowing down will give more control when ending the stroke. When modelling fabric there are some key factors to consider: gravity and weight. Gravity affects cloth as it flows down and sags or drapes around the torso. Sweeping alternating curves help to provide a feeling of fabric weight due to gravity. Another factor is stress, and the tightness caused by the pulling effect on areas such as the armpits and crotch. This type of fold tends to fan outward from the primary point of tension. It’s important to vary fold width and distance from one another – as well as varying thickness and length – to look more realistic. Creases in areas such as inner elbows and behind the knee also need to be considered. Cloth tends to fold in a criss-cross or accordion shape; creating a series of alternating inward and outward strokes using the Orb Cracks brush helps to get nice results quickly. Finally, don’t forget the body wearing the fabric – the underlying anatomy. Some areas such as the shoulders, elbows and kneecaps cause a stress that displays the muscle or bone beneath the cloth. The folds near these areas tend to be small stress pulls, but it is important to pay attention to creating these subtle folds. Polypainting can be difficult at times, especially when you’re first learning the ropes. One method I personally prefer and which works well with stylised characters is painting ‘dark to light’. It’s an old traditional method used by the masters in oil painting that also works well in texturing: it helps simulate cavity painting without the pain of setting adjustments. On skin textures such as the face I’ll also use a heat intensity technique where I use a Colour Spray pattern and spray alpha to apply cool blues to colder areas of head and neck, and red/orange shades to the warmer areas of the face like the eyes, nose and mouth areas. I’ll then do a final build-up of highlight tints – lighter flesh, pale yellow and finally a warm, off-white colour. I also change my alpha pattern to a scratched texture, which gives the appearance of burnished surfaces and hints of skin reflection. If you want to try Polypainting Sir Robin yourself, look for decimated_ headSculpt.obj in the scene files accompanying this tutorial. Working on the sword texture incorporates many of the same Polypaint techniques but with stronger colour shifts and highlight effects. Begin by colouring the entire object with black, followed by a spray pattern with dark olive green. I use olive because it’s a neutral earth tone shade that works well with many materials, from worn leather to shiny brass. As I begin building up the colour layers, I’ll also hit many of the different materials with the same shade of colour just to keep them in unison with each other. As I begin to fine-tune each material, I add highlights and burnishing effects. One final trick I’ll add is a gentle overspray of a complementary colour. For example, if a leather is greenish in colour, I’ll gently run over some areas with a deep reddish brown shade to tone down the green and give it a more natural, realistic feel. On shiny brass or gold material, I’ll add some soft desaturated purple or blue hues, which helps give a pleasant fill light effect. In the accompanying scene files, you’ll find swordPolypaint.ztl, the full sword .ZTL file with all division levels and Polypaint details. Michael Ingrassia is a character artist and instructor, specialising in modelling and sculpture for games and film. Technical leads John Cleveley and Tom Maslen reveal the tools they use to ensure the BBC News site behaves itself. RWD has far more visual variations than traditional approaches. This can lead to frontend code becoming increasingly fragile. You can’t get better than having real devices to test on: feeling the tactile response and quirks can make the difference between a good site and a great site. This is tough for small teams who can’t afford a cupboard full of devices, but even investing in a few of the most popular ones will be money well spent. Once you start to build up your collection, a tool like Remote Preview saves a lot of time. It lets you preview your site on a large number of mobile devices at the same time, so you can quickly scan through your pages across devices and pick up layout and behaviour issues. For responsive sites, you can easily resize the PhantomJS window to check behaviour at your breakpoints. For example, we can test if HTTP requests for ‘Tablet’ components aren’t requested by smaller devices. PhantomJS has another killer feature. You can take fully rendered screen shots of your site. We use this to crawl the site, taking shots of pages on our live site and re-running on our test server. You can process the images with ImageMagick to compare each page at each resolution. Picking out visual regressions becomes a piece of cake. Performance is probably the easiest area to neglect. But ignoring it can slowly ruin your site. Again, PhantomJS to the rescue! The browser has an API to save an HTTP ARchive (HAR) file, which records all the requests made by the browser. Uploading HAR data to a tool such as HAR Storage or HTTP Archive helps to visualise HTTP metrics over time and highlights areas to optimise. Mark Otto, creator of Bootstrap, explains how to get started with the frontend toolkit, and how to transition from vanilla starter template to distinctive page. In this tutorial, Bootstrap creator Mark Otto will walk you through the basics of Bootstrap: what’s included, how to use it in any project, and how to best customise a typical Bootstrap template. “Using Bootstrap doesn’t have to stop with its default components and styles,” he says. “With a little HTML and CSS, we can do just about anything. So, let’s dive in! We need to put together the most basic version of our page template: HTML scaffolding to render the page and link to the Bootstrap assets. This is the most basic form of a Bootstrapped web page: simple HTML with just the CSS included. That can work fine in some cases, but what we really want is a page filled with a few Bootstrap components, some custom content and a few design tweaks to top it off. It’s time to add some Bootstrap components. We’ll swap our ‘hello world’ message for a nav bar and carousel, and we’ll use the grid system to write a three-column section for our marketing copy. Do note that we’re also simplifying the HTML in this post, but the complete code is in the downloads. Creating columns in Bootstrap is easy with the built-in 12-column grid system. To use it, create a .row to house the columns. For each column of content, specify how many grid units the column should span. In this case, we want three columns spanning four grid units, so we have three instances of .span4. The grid system enables you to make any layout to house just about any content – just create the columns and add in your content. Below the columns we’ll add our own new component, .featurette (using some of the coding best practices found in Bootstrap), to house some larger marketing messaging and visuals. You’ll see we have a base class, .featurette, for the core component. Within that, we’ll use prefixed classes such as .featurette-image and .featurette-heading, to easily target elements within our component. Prefixed classes ensure shorter CSS selectors, fewer lines of code, and smarter categorical naming schemes. With these basics in place for our new component, it’s time to move on. OK, so we’ve Bootstrapped our new HTML page, utilising some of the ready-made components and grid system, as well as writing our own component. Next let’s customise the default carousel and nav bar a bit. We’ll stretch out the carousel and style each slide, then increase the height of the nav bar and layer it on top of the carousel. There are two basic ways to customise Bootstrap components: modifying HTML and adding additional CSS. The best implementations do both, and this tutorial is no different. If you recall from our HTML, we wrapped the nav bar in its own container (for centring on the page) while the carousel sits on its own. We use position and z-index to render the nav bar on a higher plane than the carousel, and a negative ‘margin-bottom’ to pull up the carousel. We’ll also increase the padding on the nav bar links to make it a bit taller. Now, we have to align the text in each carousel slide with the rest of the page. By default, the carousel includes only an <img> for the background of each slide and a <div> to house the caption. To make the carousel look like our final example, we’ll change the next and previous controls and customise the captions. The CSS is lightweight, involving some light overrides and modifications. With a few tweaks to the text within the caption, we have our finished carousel. Lightweight HTML changes and around 20 lines of CSS give us a custom look, while maintaining all the awesomeness of Bootstrap’s default component. Now it’s time to write our own component, the featurette. We already have almost all the HTML written, so let’s just get some basic styles in place. Our inspiration for this component is marketing content like that of Apple: big headings, lightweight text and some large visuals. And that’s it really. Given Bootstrap’s default styles, the amount of custom CSS we have to write for a new component is quite low. Bootstrap’s default typography styles such as .lead provide us with great looking marketing text while utility classes like .pull-right enable super fast floats. Without these, we’d have to rewrite common CSS for each custom component. Phonebloks is a concept phone made of easily-replaceable and customisable component blocks to help curb the rise in electronic waste. In this day and age, people have started throwing out electronic devices like everyday trash. With the release of the new iPhone 5c, Apple fans will no doubt be quickly replacing their old models with the latest offering. And it’s not just new models causing the ever-rising electronic throw-away – a phone only lasts a couple of years before it breaks or becomes obsolete. However, it’s usually only one part of the device that needs replacing but we often throw away everything as it’s almost impossible to repair or replace. Here, designer Dave Hakkens has decided to come up with a solution that is designed to last. Phonebloks is made of detachable ‘bloks’. The bloks are connected to the base which locks everything together into a solid phone. If a blok breaks you can easily replace it, if it’s getting old just upgrade. Basically, it’s like an app store for hardware! And anything that promotes sustainable design is a winner in our eyes.